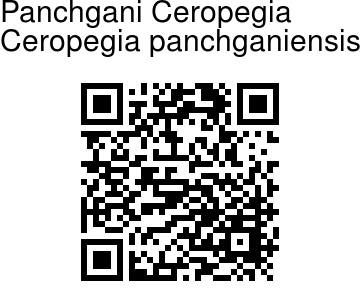 Panchgani Ceropegia is a critically endangered species of Ceropegia. It is very specific in its habitat requirements and therefore restricted in distribution. It is an erect tuberous herb, perennial, 30-50 cm high. Stems are round in cross-section, minutely velvety above, hairless at lower part, sometimes branched at the base, branches 2-3. Leaves are ovate, 6-9 x 3-4.5 cm, tip pointed, base rounded or somewhat heart-shaped, hairy above and hairless underneath. Leaf-stalk is 1-2 cm long, puberulous, grooved above. Flowers are borne in 5-8 flowered cymes carried on peduncles 5-15 mm long, hairy. 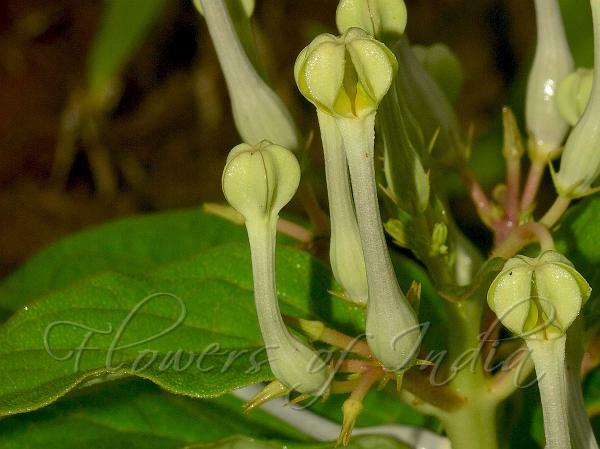 Flower-stalks are 8-15 mm long, hairy; bracts are few, 3-4 mm long, hairy. Calyx is divided to base, about 5 mm long. Flowers are 2.8-3.5 cm long; tube 2.2-2.8 cm long, slightly curved, base inflated, inside a ring of hairs at the bottom, above narrow, cylindrical, purple coloured; lobes elliptic-ovate or obovate, about 6 mm long, glabrous, greyish-white or yellow coloured. Outer corona of 5 shortly bifid, hairy lobes; inner erect, clavate, hairy. Pollinia five, pollen masses solitary in each anther cell, yellow, waxy with pellucid layer, attached by light-brown caudicles to dark-brown corpuscle. Follicles are in pairs. Photographed in Pune district, Varandha Ghat, Maharashtra.